Hello! I know, I know- I haven't blogged for a REALLY REALLY long time, but I had a whole lot of family problems, and junior year problems, but I promise that I'm back now- for goood! And then, till I lose consciousness from smoke inhalation or get crushed, Final Destination style, by a burning slab of god knows what, I will stand in front of my bookshelf deciding what books to take. So, there you have it. My three. THAT WAS THE HARDEST THING I'VE EVER DONE. AAAAAAH. Alright, so leave a comment below, and do follow me via BLOGLOVIN, and leave me a link, so I will be SURE to follow you back! YAY to new friends! P.S: I just started an Instagram Account, and if you could follow me there, it would be SIMPLY BRILLIANT! (just search @aditinichani) Incase there's more than one, my description goes something like: Indian. Sixteen. Blogger. Insane. I got the opportunity to read Eleven Weeks and it's prequel, although they can be read as stand alones. I thought reading the prequel would better prepare me for Eleven Weeks, but instead, it was the biggest kind of spoiler. So, if you're going to read the books (which I hopefully convince you to do by the end of this) I SINCERELY suggest you start with this one, because it is, by FAR, a better and BRILLIANT book! I knew who Stacey was in book one, and she seemed like no one in particular, but I'm SO glad that Lauren McKellar decided to give her a voice, because I absolutely LOVED it! As soon as the book opens, you get to know that Stacey is seen as one of those dumb blond girls; ones who are made believe that they will never break the stereotype, but you can SO clearly see that that's not who she is- she's better than who she thinks she is. She has a secret, one that is threatening her life as she knows it, ruining her self esteem and yet, at the same time, making her grow up in ways she never thought she could. And then there's Michael. Every bit as swoon worthy as Meg Cabot's Michael, and maybe even a bit better! 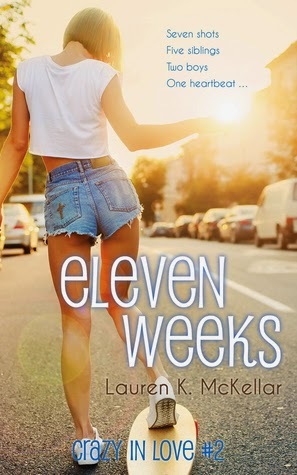 I'd thought of a lot of things to say about Eleven Weeks, but as it turns out, I can't describe what this book made me feel! There was something so similar about it, and yet something so wonderfully different. It was like seeing the world through the eyes of someone you would have previously taken for granted- and it was simply (Yes, I'm saying this again) BRILLIANT!